One of the benefits of going away from my garden during the peak growing season, as I did recently when I was in Seattle, is that when I return dramatic changes have taken place. This fast forward sensation can be fun! I looked through the photos I had taken of my garden during the month of June and saw I had a series of images showing the progression of this clematis. And today, the last day of June 2013, this clematis (whose name I have lost) is fading, leaving beautiful seedheads and the next clematis, Zara, is coming into bloom! And so marches on the garden’s progression! 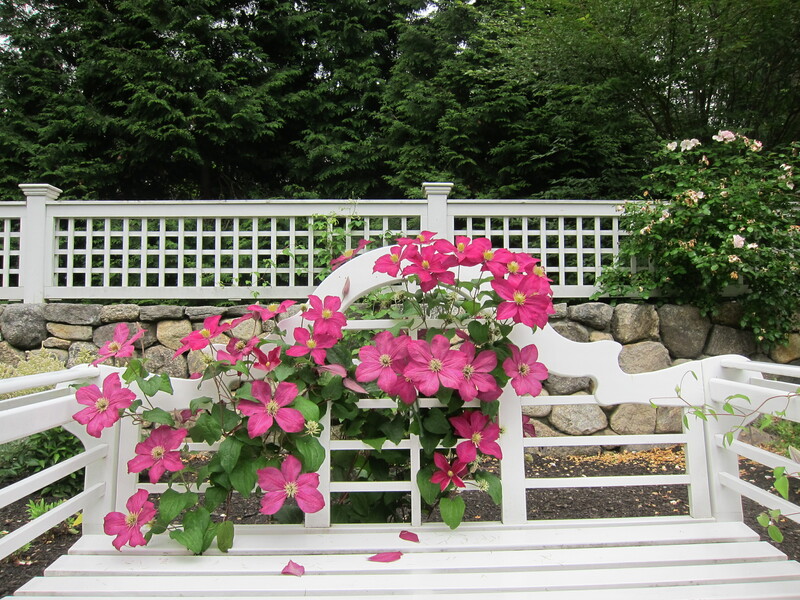 Your clematis are beautiful! I have two growing on a fence in my garden — a blue one called ‘Arabella’ which is only in its second year in the garden and unfortunately hasn’t grown tall enough yet to be seen above the foliage of plants growing in front of it. The other, Comtesse de Bouchaud is happily gracing the top of the fence and is full of buds but hasn’t begun to bloom yet. Thank you! I keep planting clematis every year with mixed results…the ones that take are lovely and easy, but for every 3 I plant, I lose two in the first year. 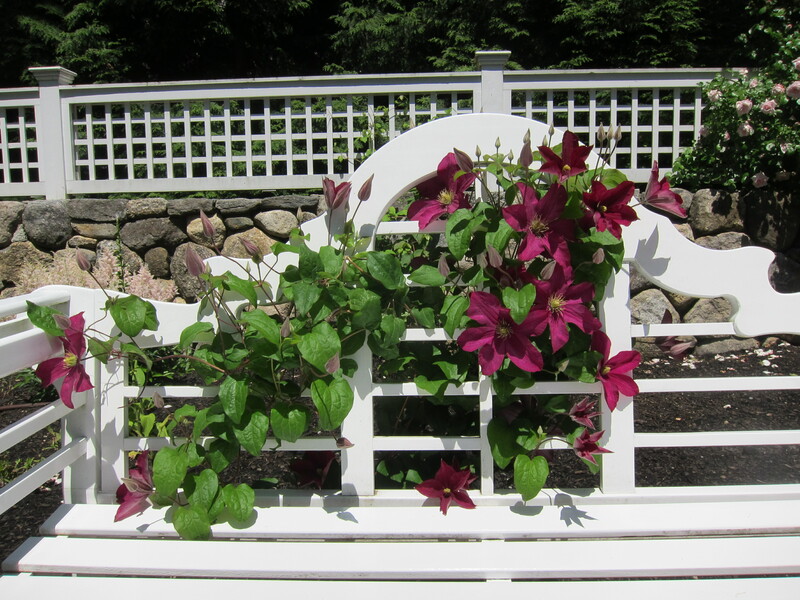 Nevertheless, there are so many wonderful clematis, I keep acquiring them and planting them, always hopeful. 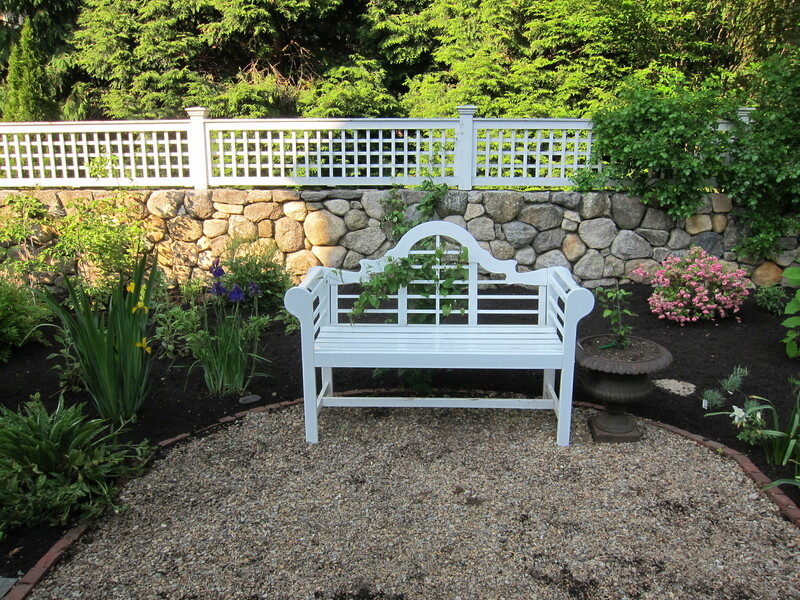 Somewhere I planted a Comtesse de Bouchard, but I can’t remember where or if it has grown…I’ll have another look. your beautiful clematis looks like Ernest Markham to me….Em has 6 deeply textured tepals and small-ish yellow/gold stamens, flowering time is correct too. great placement ! Ernest Markham sounds promising! I think I purchased one of those once. THANKS, Cheryl, I knew you’d know! 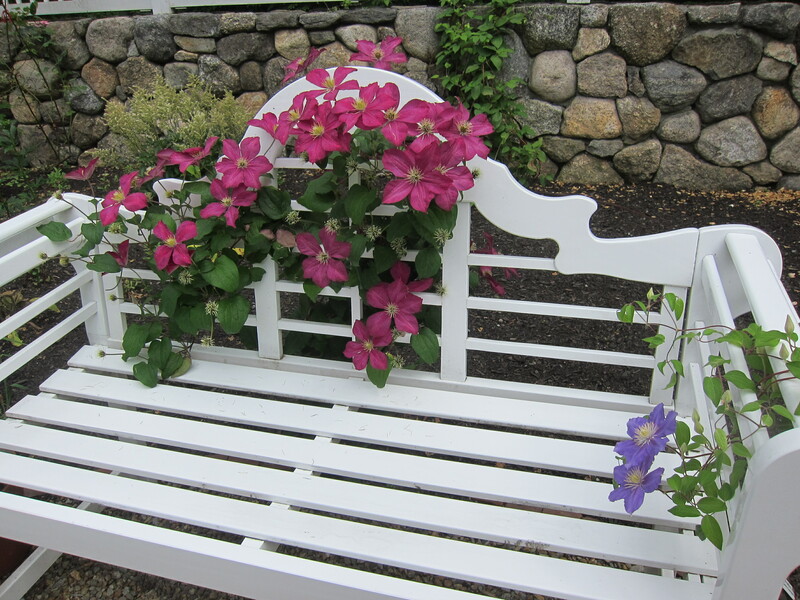 What a great idea to have the clematis coming up the back of a bench. 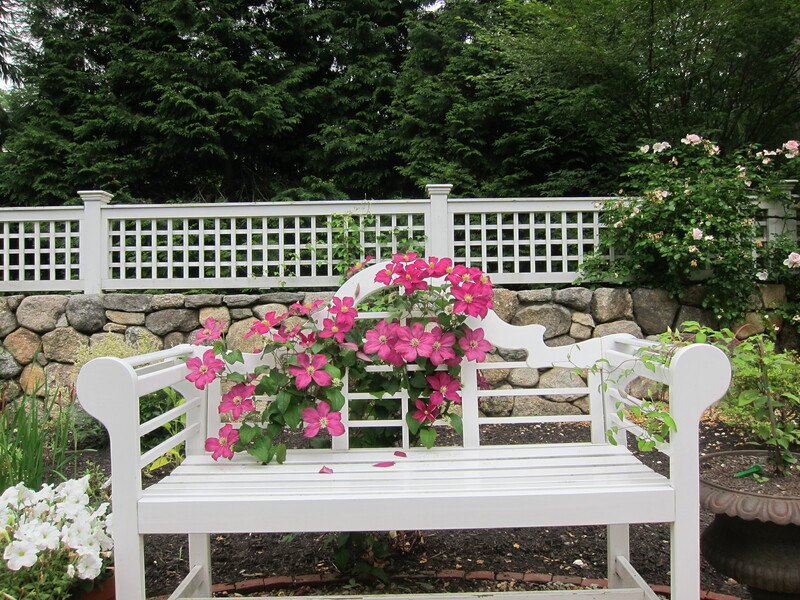 You can perch on the seat and spend a little quality time up close with the blooms. 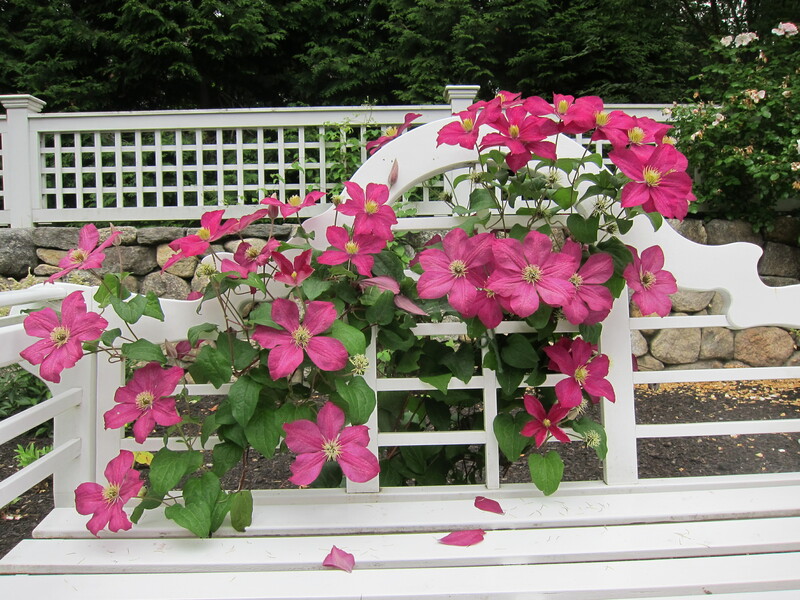 YES, unless I sit back and crush the clematis!!! 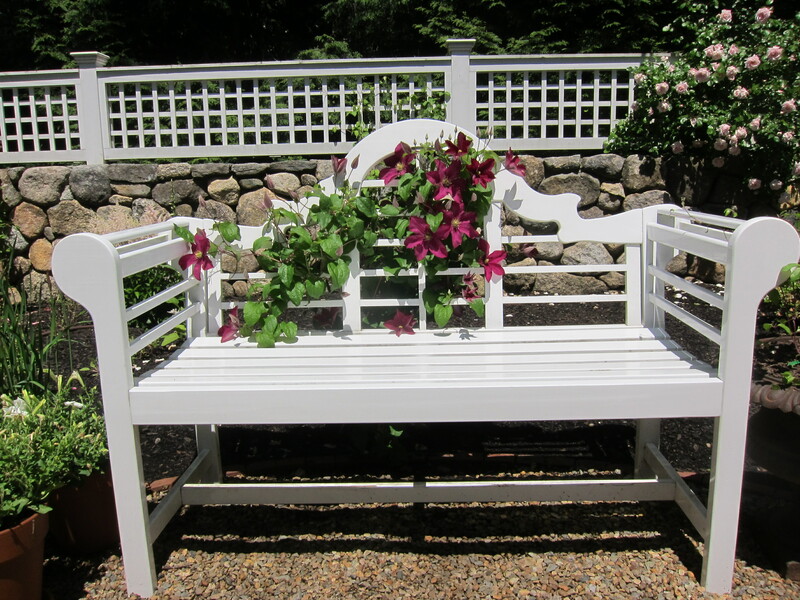 Having the clematis there does encourage very good posture. Thanks for posting. 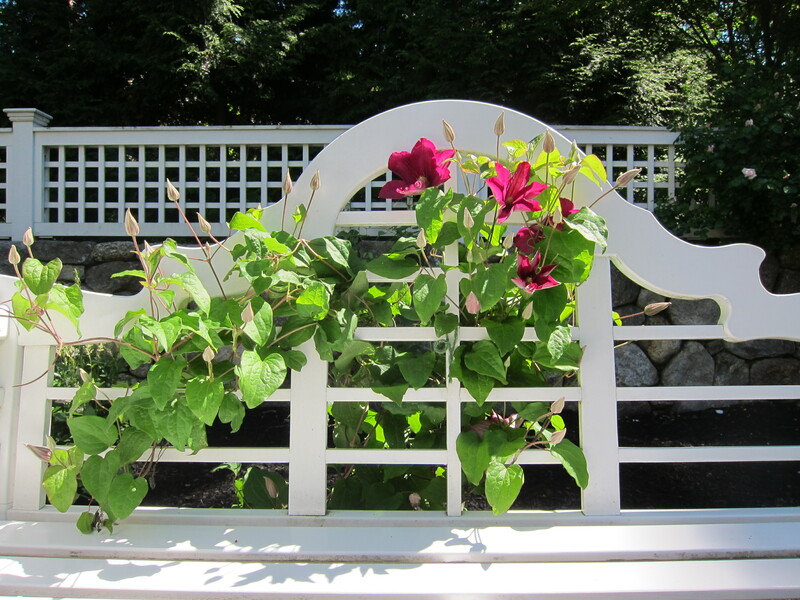 What a beautiful way to showcase your clematis.